Mythic Pest Control: Are you tormented by flying Harpies? Is the local Sea Beast loose again? Don't turn to stone - turn to us! We can help. Dial 1-800-BC-HERO today. Our heroes are available 24/7 to rid you of unwanted giant arthropods, smelly supercrabs, nauseating stables, too. Our family-owned business has direct Olympus connections from birth. No job is too big. Lighting sky bolts available for extra service fee. Satisfied customers reviews: King Cepheus: "Perseus not only saved my daughter - he saved my kingdom. He deserves my highest gratitude." 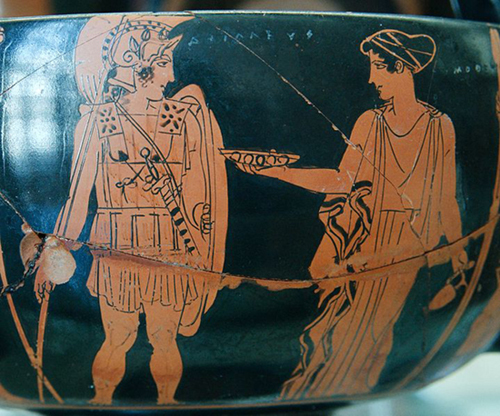 Proud Goddess Thetis had this to say: "I've never been so proud of my son Achilles. He's on his way to fight Troy". Queen Penelope of Ithaca: "We are so pleased with my husband's sacking of Troy by clever use of a Wooden Horse. I can't wait for his return." Good family breeding is getting rarer in this modern BC world but there are still Titans on our staff that will move mountains for you. Loved one departed across the River Styx and past Cerberus into Hades? Do you really, really want them back? Ask for demigod Hercules. Troubled by constant demands by hideous horned man-monsters to sacrifice your children? Don't settle for less - Theseus is the best! This offer available only in pre-classic era Greece. There is no direct service to other millennia at this time.